A unique blend of physical comedy, award-winning juggling and the extraordinary talents of more than 30 rescued performing pets. Voted Best Family Show in Las Vegas! “The New Yorker” named Gregory Popovich “One of the Worlds Best Physical Comedians”. Gregory Popovich performed on “The Tonight Show” with Johnny Carson, Jay Leno, “Late Night” with David Letterman, “The Late Late Show” with Craig Ferguson and was a finalist on America’s Got Talent. Gregory Popovich, producer and star of the show with his entourage of 30 rescued furry four-legged performers, have traveled and performed throughout the United States and all over the world. The past nine years the show has been featured at the V Theater, inside Planet Hollywood Resort and Casino. Comedy Pet Theater is a family-oriented theatrical circus blend of unique physical comedy, starring the extraordinary talents of Gregory’s rescued performing pets which he has saved from animal shelters across the country and gave them a second chance as Las Vegas stars. During the live show audiences will witness acts such as the Dog Classroom, the Amazing House-Cats, the Animal Train Station, and other acts in the show that will treat audiences to surprise appearances from more animal performers, including trained doves, parrots, goats, and even a miniature horse named Diamond, along with acrobats, mimes, contortionists and jaw dropping juggling by internationally acclaimed award winner Gregory Popovich, who has won numerous juggling awards and is known as one of the top three best jugglers of the world. Currently, he holds the world record in a balancing/juggling feat in which he stands atop a nine foot free standing ladder and juggles nine rings. Gregory Popovich is a lifelong advocate of animal rights. He has participated in fundraisers for animal shelters and neutering programs across the nation. 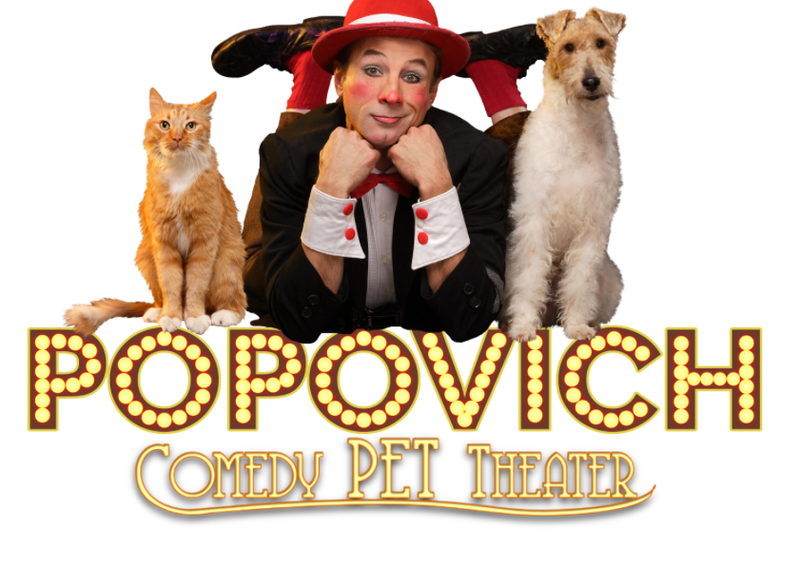 Public-service announcements promoting responsible pet adoption are staples of Popovich’s Comedy Pet Theater. All pets that perform in Comedy Pet Theater are rescues from shelters — and serve as furry ambassadors for animals seeking homes. “When people see these amazing, healthy animals on stage and decide to adopt an animal from a shelter themselves, my main message has reached the audience,” says Popovich — who grew up backstage in where his parents performed the circuses, with pets frequently his only playmates. He bonded closely with the dogs and cats, learning to communicate via words, signals and body language — a skill he likens to that of Mowgli, the child character in Jungle Book. Today, the furry or feathered performers in Comedy Pet Theater live in comfortable quarters as members of Gregory and wife, Izolda’s, extended household in Las Vegas. Those who grow too old for the stage live in pampered retirement. Popovich is a master animal trainer who employs positive-reinforcement techniques in his training — coaching individual animals to perform tasks based on their natural habits. He has shared his expertise for raising, training and living harmoniously with pets in two books: You CAN Train Your Cat: Secrets of a Master Cat Trainer, and, Doggy Gone Good: A Master’s Guide to Teaching Manners, Tricks and Healthy Habits.